Invited and selected articles from various professionals within and related to the design industry. Looking for something in particular? Use the search below to filter our resources. 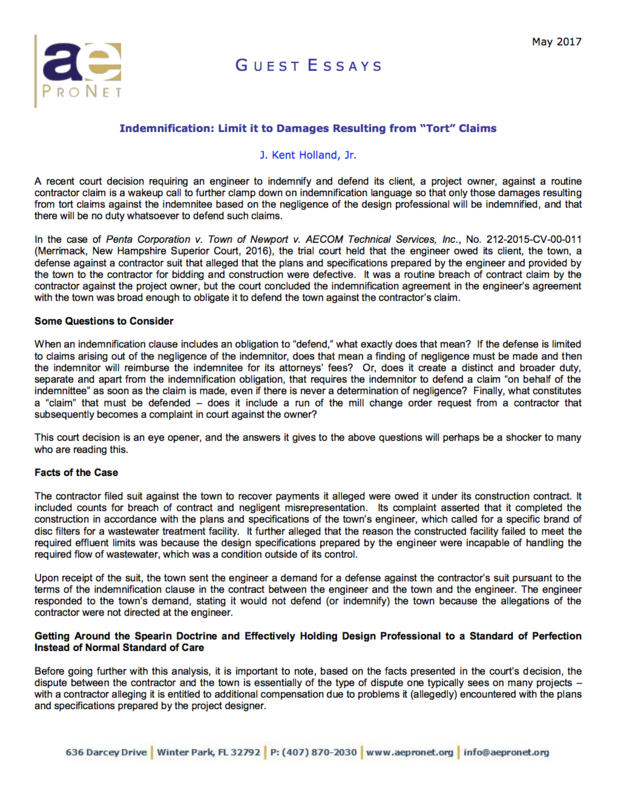 A recent court decision requiring an engineer to indemnify and defend its client, a project owner, against a routine contractor claim is a wakeup call to further clamp down on indemnification language so that only those damages resulting from tort claims against the indemnitee based on the negligence of the design professional will be indemnified, and that there will be no duty whatsoever to defend such claims. You’ve worked hard to establish your business and plan to stay actively involved in its future success. So, why would you plan your exit from it now? Because, as the saying goes, if you fail to plan, plan to fail. You won’t lead your company forever, and statistics show most businesses don’t make it past the second generation of ownership due to the lack of a proper and thorough succession plan. In a wave of change that children of the 1960s only dreamed, debated and theorized about, almost half of the states in the United States have now passed laws legalizing the controlled distribution of medicinal marijuana, and two states have even legalized the sale of recreational marijuana. While this could truly be the “Dawning of the Age of Aquarius” straight out of the Broadway musical Hair, these new laws raise a variety of questions for employers who have drug screening programs or any type of drug-free workplace policy. 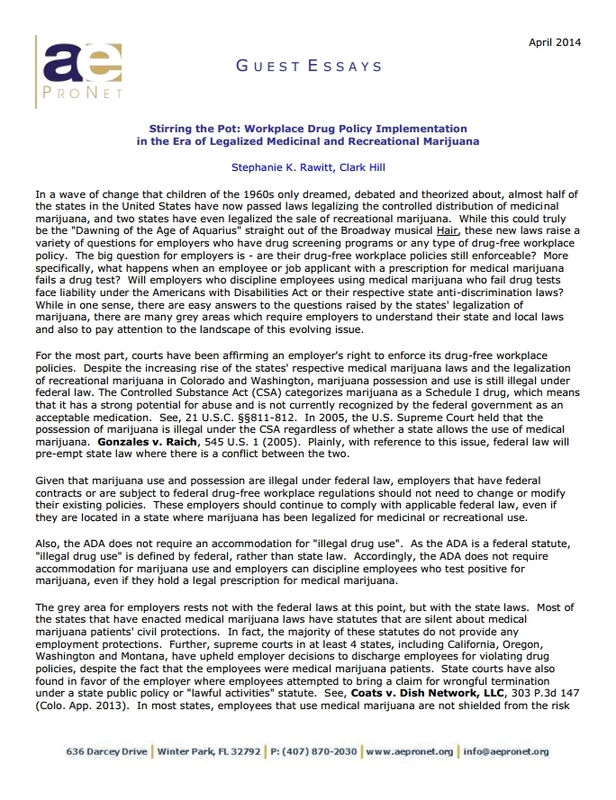 The big question for employers is – are their drug-free workplace policies still enforceable? More specifically, what happens when an employee or job applicant with a prescription for medical marijuana fails a drug test? 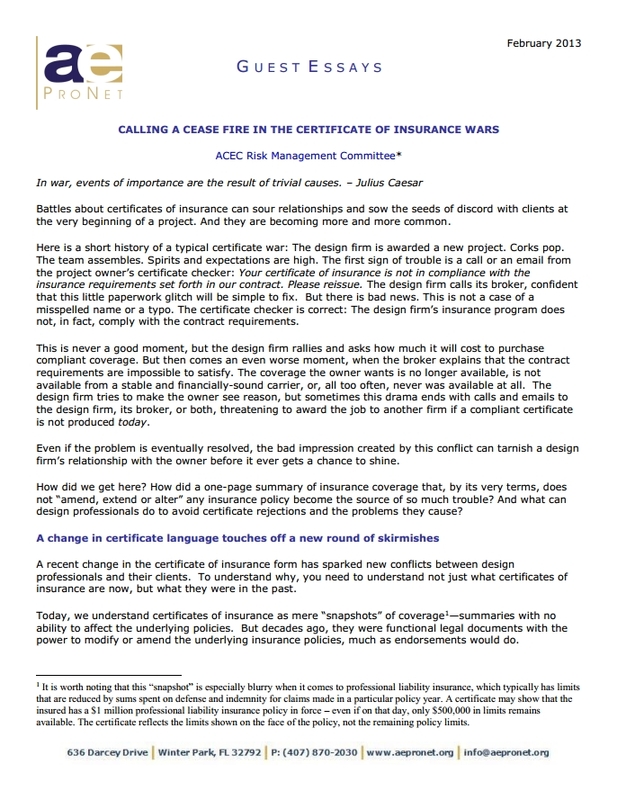 Battles about certificates of insurance can sour relationships and sow the seeds of discord with clients at the very beginning of a project. And they are becoming more and more common. Here is a short history of a typical certificate war: The design firm is awarded a new project. Corks pop. The team assembles. Spirits and expectations are high. The first sign of trouble is a call or an email from the project owner’s certificate checker: Your certificate of insurance is not in compliance with the insurance requirements set forth in our contract. Please reissue. The design firm calls its broker, confident that this little paperwork glitch will be simple to fix. But there is bad news. Th is is not a case of a misspelled name or a typo. The certificate checker is correct: The design firm’s insurance program does not, in fact, comply with the contract requirements. Frequently, general contractors will work with the same subcontractor or supplier on two separate, unrelated projects. When that happens, the situation may arise that on the first project (Project A), the subcontractor defaults on its contract, resulting in a back-charge that exceeds the subcontractor’s contract balance, i.e. the subcontractor owes the general contractor money. On the second project (Project B), the subcontractor satisfactorily completed its work and is due money from the general contractor. 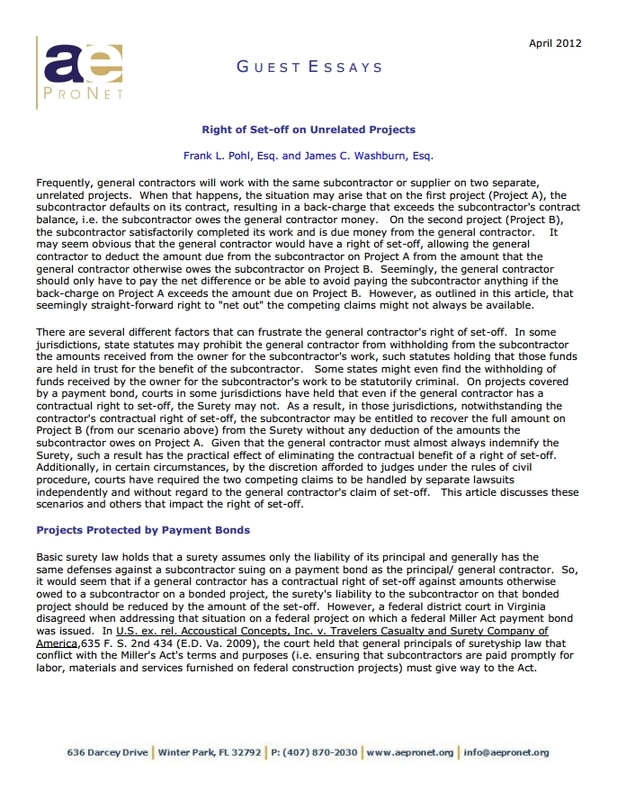 It may seem obvious that the general contractor would have a right of set-off, allowing the general contractor to deduct the amount due from the subcontractor on Project A from the amount that the general contractor otherwise owes the subcontractor on Project B. Seemingly, the general contractor should only have to pay the net difference or be able to avoid paying the subcontractor anything if the back-charge on Project A exceeds the amount due on Project B. However, as outlined in this article, that seemingly straight-forward right to “net out” the competing claims might not always be available.